The 1984 Houston Astros outscored their opponents by 63 runs while hitting just 79 HRs. 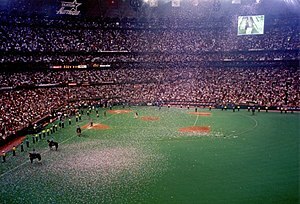 Fortunately for Nolan Ryan, Mike Scott and Joe Niekro they played in the freakin Astrodome which posted a 92 park factor. Houston managed to score the 3rd most runs in the NL despite playing in the Dead-Ball Era part II. Jose Cruz, their 36 year old left-fielder slugged .371 at the Astrodome with exactly 0 homers in 286 ABs. So how did he “rake” you say? Well, in 80 road games he cracked 12 HRs and slugged .545 (1.5X the league!). Alas, Cruz received 10 fewer HOF votes than Don Baylor in their only year on the ballot.